The Sprint Hart CP and Sprint Hart SV are JDM Wheels produced by Takechi Project. Both Sprint Hart Wheels feature a short 10 spoke design, the difference is the Sprint Hart SV are offered in smaller sizing for The popular Kei Cars in Japan. Sprint Hart CP and Sprint Hart SV both feature two piece welded construction, and are manufactured by SSR Wheels. 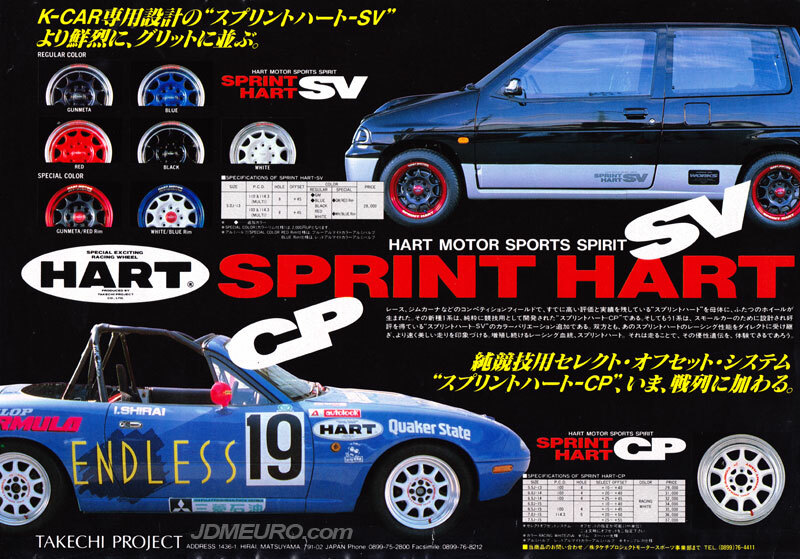 The Sprint Hart SV shown are mounted on a Suzuki Alto Works; and the Sprint Hart CP are on a NA series Mazda Miata. Also shown are the various colorways the wheels were avialable in. Also notable is the phrase “Hart Motor Sports Sprint” in the print.